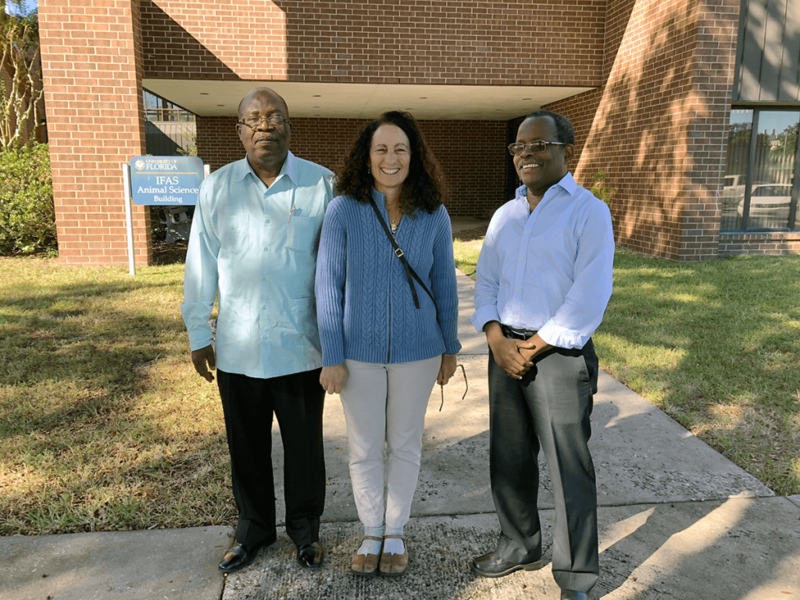 Rose Koenig (center), principal investigator of the AREA project, hosted two leaders of Haiti’s state agricultural college — Jocelyn Louissaint (left) and Ophny Nicolas Carvil on a tour of UF/IFAS labs. By all accounts, Haiti’s nearly century-old State University of Haiti’s Faculty of Agronomy and Veterinary Medicine (FAMV) was an impressive green oasis in Port-au-Prince, graced by a majestic stand of mangoes and a modernistic main building. But that was before the catastrophic earthquake struck at 4:53 p.m. on Jan. 12, 2010, which devastated Haiti’s capital and shocked the world by causing the deaths and injuries of hundreds of thousands of people. The epic quake also destroyed the centerpiece building of FAMV, the highly selective agricultural college that each year trains hundreds of Haiti’s engineers in agronomy. Nearly nine years later, the small campus still bustles with activity, but students mostly receive instruction in makeshift classrooms, some on the roofs of the remaining academic building, and rub elbows in under-equipped laboratories. That’s the backdrop for a recent visit by two of FAMV’s leaders, Dean Jocelyn Louissaint and Vice Dean of Research Ophny Nicolas Carvil, who came to tour scientific labs at the University of Florida/Institute of Food and Agricultural Sciences. Their mission: to learn about the design and operation of IFAS’ teaching and research labs as they rebuild their campus and prepare to set up new laboratories. Another important goal: To deepen their college’s ongoing collaboration with UF/IFAS Global. They were hosted by Dr. Rose Koenig, interim director of IFAS Global, and her team at the Feed the Future Haiti project known as AREA, a French acronym for Appui à la Recherche et au Développement Agricole, or Support to Agricultural Research and Development. During a whirlwind three days on campus, the Haiti visitors not only met UF professors and researchers who can help them set up modern scientific laboratories, but they saw plenty of familiar faces, including FAMV graduates who conduct research in UF/IFAS labs while they earn master’s degrees through an AREA program to train Haiti’s next generation of agricultural leaders. Louissaint and Carvil explored UF/IFAS’ most high-volume labs and met Dr. Rao Mylavarapu, director of Analytical Services Laboratories, where each year UF/IFAS analyzes where more than 50,000 soil, water and other samples. They visited the Plant Pathology Lab, and labs under the umbrella of the Agricultural and Biological Engineering — such as ones devoted to robotics, water quality, biosensors, precision agriculture, agroclimate — and even dropped in to learn about the Honey Bee Research and Extension Lab. Additionally, they met with Kevin Heinicka, director of the UF/IFAS Office of Facilities Planning and Operations, to learn about what goes into planning and constructing modern scientific laboratories. Frank Moses, whose mechanical, electrical and fire protection engineering firm has designed dozens of labs for UF and other universities, also consulted with the Haitian visitors via a conference call. They discussed not only technology and equipment, but issues related to utilities (such dealing with a power outage, a not infrequent occurrence in Haiti), safety (how to ventilate noxious gases?) and practical (how many sinks does a lab need?). FAMV has begun construction on its multimillion-dollar reconstruction project (1), with the first phase scheduled for completion in late 2019, Louissaint said. This phase will include about 15 chemistry, soil, plant pathology and other laboratories — triple what the college has now. He added it’s difficult to be precise about the completion date for the entire project because they are still seeking the remaining funding needed. But Louissaint and Carvil indicated that building laboratories is one thing, but understanding how to best equip, manage and run them is another. And, that’s a big part of what they learned here. “We hope specialists in this area can go to Haiti and to see how the labs will be really functioning and provide additional services we are looking for,” Louissaint said. To provide even more meaningful insights, Heincka, Moses and Mylavarapu are planning to fly to Port-au-Prince in the coming weeks to spend a few days consulting with faculty, staff and others to better understand their needs and provide on-the-ground guidance. 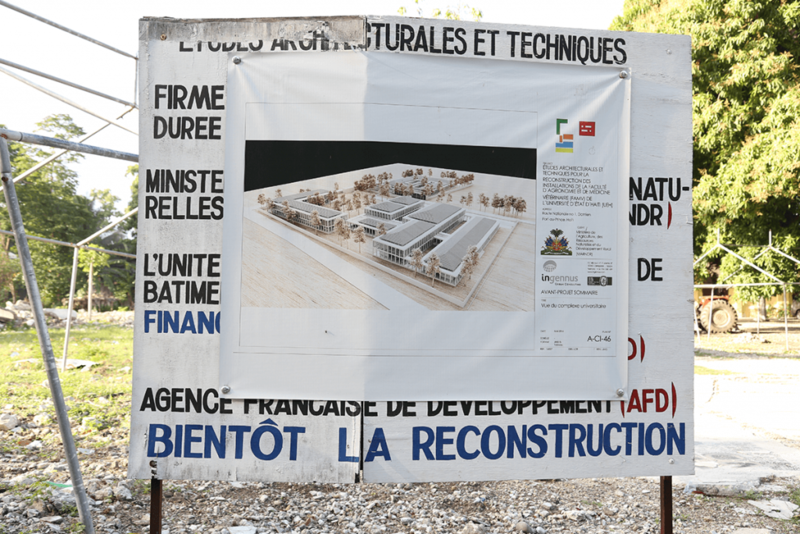 A sign on FAMV’s campus in Port-au-Prince shows a rendering of the redeveloped campus on the site of the main building that was destroyed in the 2010 earthquake. Carvil said the trip also allowed them to consult with IFAS plant pathologists on some of Haiti’s most challenging issues involving plant diseases. Carrie Harmon, who runs the UF/IFAS Plant Pathology Lab, said she had a productive visit with the Haitian academicians. She emphasized the importance of a good plant diagnostic lab to a healthy, productive agricultural sector. That’s because there is a never-ending need to precisely identify and manage new and emerging pathogens and pests — undeniable threats to Haiti’s insecure food supply and fragile agricultural sector, which is dominated by subsistence farmers who have limited resources. “You can’t manage plant health problems if you don’t know what they are — diagnosis is critical,” she said. In Port-au-Prince, visitors to FAMV’s campus these days can glimpse what FAMV’s future might look like. A large sign depicts an architect’s rendering of a sparkling, rebuilt campus. If all goes according to plan, before FAMV celebrates its 100th anniversary in 2024, this vision of Louissaint’s and Carvil’s will become reality — with a little help from UF/IFAS and the AREA project. (1) The building project is financed by the Inter-American Development Bank (IDB), and has been promoted by the Haitian Ministry of Agriculture, Natural Resources and Rural Development. The French Development Agency (AFD) helped fund the building study. Charles is the communications manager for UF/IFAS Global and the UF-managed Feed the Future Haiti AREA project.